NEW!!! Awesome GPS-guided travel articles for Ho Chi Minh City. Hooray, I’ve finally made it into the 21st century. I have to admit I’ve been a little slow on the uptake with smartphone technology and tend to use mine just for messaging, maps and phone calls. But I’m very excited to team up with GPSMyCity to turn my most popular posts into really helpful travel apps. For those who love my free walking tours, the news has just got better. Let’s face it. When you’re out and about in a new city, it’s an excellent idea to access the latest blog posts and recommendations to help you enjoy the most from your visit. But if you’re using data from home, that can turn out very expensive. And, unfortunately, WiFi isn’t always available everywhere you go. That’s where my new GPS-guided travel articles come into play. The GPS coordinates are embedded in the articles with the map of the route I’ve described in the post. It’s just like having a personal tour guide! 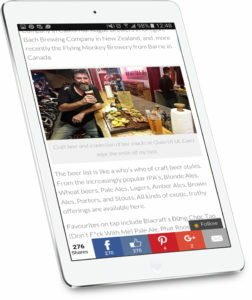 Once the app is downloaded to your phone, you don’t need any internet to use the article as a guide. It will show you right where you are on the map and guide you to each location! And it’s not just me; there are now thousands of these types of articles from around the world at GPSmyCity. The best part is, you can upload any travel article from GPSmyCity free of charge, so that you can read them wherever, whenever. If you decide you want the GPS assistance, it’s about $2 to upgrade. Super easy! Super-cheap! SPECIAL BONUS just for you…Drum roll, please….It’s FREEBIE Time! From the 12th – 19th September, I am offering free upgrades of my hugely popular “Favourite Bars in Saigon” guide. It’s a NO-RISK way to check out if you think the app is useful. 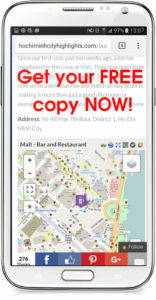 To access your FREEBIE – Click on THIS LINK (if you haven’t already downloaded the free GPSmyCity app, you will see a prompt to do so). After downloading the app, you will be directed to the article, where you can choose UPGRADE to get the GPS-guided version. Alternatively, use the GPSMyCity app to search for mine or any other article you find interesting. Free Upgrade for a limited time. Find out the best way to see all the major (and some not so touristy) sites around Saigon. And let me know what you thought in the comments below and, list other guides you’d like to see. Disclosure: If you do upgrade one of my articles, I get a few pennies to put in my piggy bank. It doesn’t cost you any more than usual, but it does go some way to support this site and keeps me motivated to keep writing about my explorations. Next story Playing Around at Board Game Station Coffee. Previous story Malt – Not just all about beer! Is Ho Chi Minh City Safe? What to take to Vietnam – NOT MUCH!